With my next round of wood splitting I decided to capture some time-lapse video of the process. Below you can see the video. I feel like I’ve got the process down a bit better than my first outing. As you can see from the images, my pile of split wood has grown a good bit, which itself is an issue to deal with. These are still the smaller pieces of what I have available to split. When I originally stacked the logs I put them vertically and two deep. Probably not the best strategy. 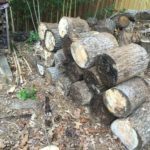 I have stacked a few of the medium sized logs horizontally to help them dry out some. Wood Splitting TimeLapse from Steven Joerger on Vimeo.